Wi-Fi routers are an indispensable part of any modern home, as they enable you to easily establish a wireless network. This makes using your devices more enjoyable as you don’t have to connect directly to your modem every time you want to access the internet. But, not all Wi-Fi routers are created equally. Some enable faster connection speeds and more consistent coverage while also offering a buffet of features that many modern users will appreciate. Wireless mesh networks are trending right now, which primarily influenced our selection of Netgear’s Orbi as the best Wi-Fi router currently available. We think Orbi is not only the best mesh Wi-Fi router but the best Wi-Fi router overall. In this article, we give a brief overview of the Orbi, discussing its benefits and drawbacks. Then, we compare it to similar products on the market, offering our final thoughts on why the Orbi is the best Wi-Fi router. How does the Orbi Wi-Fi Router Compare to Competitor Products? Customers can purchase the Orbi Wi-Fi router on Amazon for $249.74. This Wi-Fi router offers 2000 square feet of coverage and uses tri-band technology. This means that three bands are available for communicating data over the wireless network. This router connects to your modem, though Orbi also sells a model that is a dual router-modem. This model can be purchased on Amazon for $249.74. Both of these models are expandable, allowing users to purchase additional satellites in order to create a wireless mesh network. In wireless mesh networks, each satellite or node communicates with the others, allowing for more efficient coverage and faster speeds. In a sense, each Orbi satellite acts as a traditional Wi-Fi extender, enhancing the coverage in a certain part of our network. Orbi offers many packages that include routers and various satellites, allowing users to expand and enhance their coverage as much as they want. Each Orbi Wi-Fi router comes with 4 ethernet ports as well as parental control settings for monitoring how the network is used. The other notable feature of the Orbi router is the three bands it offers for data transmission. Many Wi-Fi routers on the market only offer dual-band coverage. Since one of these two bands is used for communicating with devices and other nodes in the network, the other band must primarily support users. This can lead to it getting crowded, like traffic on a highway. This results in a slower and more inefficient network. This happens frequently with larger families that use a lot of bandwidth overall. Additionally, sometimes only one or two users can use such high bandwidth that they clog up the sole band on a dual-band system. This happens often during streaming and gaming. In these instances, a third band is ideal in order to free up the flow of data. This allows the entire network to run smoother and more efficiently, resulting in sharper images, faster speeds, and a more immersive experience of your network. This means that more devices can use the network without slowing down your connection, making tri-band technology ideal for technology buffs that use many devices over the course of a day. Alternatively, any large household or business would benefit from having three bands devoted to network communication. When it comes to a building a wireless network, it’s best to always err on the side of caution, providing more coverage than you actually need. You never know how you’re going to use the network, and you want to stay as flexible as possible for unexpected future changes. Maybe you take up gaming while you wait for your daily vlog to upload, meaning you suddenly require a much higher throughput. Orbi is one of the best Wi-Fi routers because it supports this flexibility. Its tri-band technology makes it super-efficient when multiple devices are used, which is common in today’s cutting-edge world. Many users forget that the router they purchase can be counted as a significant piece of art that is displayed in their home. Thus, the simple, elegant, white Orbi appeals to many minimalist users who want an unassuming router that does not detract attention from other parts of their home. 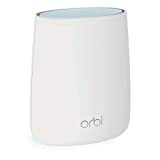 When purchased separately, the Orbi router only weighs two pounds and is less than 7 inches tall. When purchased with other satellites, the router can be as tall as 9 inches. The satellites, however, can be as small as 7 inches and some of them can be plugged in directly to the wall outlet. Orbi is one of the best Wi-Fi routers because it doesn’t negatively contribute to the aesthetic of a room. Many routers and Wi-Fi extenders look like alien gadgets, featuring tons of antennae and dangling parts. These awkward eyesores attract your eye every time you enter the room, which can be detrimental to productivity, especially if the device is in your office. With Orbi, you don’t have to worry about this loss of productivity. Orbi blends perfectly with white walls and will rarely be consciously acknowledged after you initially install it. Also, since it’s so efficient at communicating with the other satellites, you will rarely experience network imperfections, which means you can think about Orbi even less. Less thinking about Orbi translates to less looking at Orbi, and vice versa. This leads to more time spent enjoying your devices and being productive using them. The main benefit of the Orbi Wi-Fi router is that it allows users to create a wireless mesh network. Many experts think wireless mesh networks are superior to traditional wireless networks which typically use either a single router or a router and a Wi-Fi extender. Wi-Fi extenders can be inefficient or unsustainable for larger homes with more users, making mesh systems ideal in these scenarios. Additionally, mesh systems are ideal for businesses that are spread out over a large area, either horizontally or vertically. Since the satellites communicate with each other, the system is incredibly efficient at providing coverage for many people. This makes the system easier to manage and control, which is especially important when it comes to securing your network and monitoring your employees’ activity. Additionally, depending on which you satellite you purchase, you can get up to an additional 2500 square feet of coverage. This could be beneficial for extending the coverage of your base router or for boosting the speed of its current coverage. In this sense, Orbi is one of the best Wi-Fi routers because it’s so dynamic. It’s ideal for maximizing network speeds for a small household or for a larger household or business. Customers can purchase a single router to start off and then strategically buy satellites in order to build their network in a unique way. This ability is unique to wireless mesh systems and turns networking into a kind of art. Orbi offers satellites that expand coverage only 1000 square feet and plug in directly to the wall outlet, as well as satellites that are as large as the router and expand coverage by 2500 square feet. These options make you versatile as a networker, allowing you to provide the best coverage for users, whether that’s employees, family members, or friends. Thus, the numerous benefits of the wireless mesh system make Orbi one of the best Wi-Fi routers available. In terms of wireless mesh systems, Orbi has very few drawbacks. While its price isn’t cheap, it’s certainly competitive when you consider cutting-edge routers. However, each additional satellite is relatively expensive, costing at least $150. If you actually benefit from these satellites, then they are definitely worthwhile, as they are priced similarly to some premiere Wi-Fi extenders. However, many users purchase the Orbi router and then feel compelled to purchase additional satellites just to validate their original purchase. If only one or two users are modestly using a network, you might not need additional satellites. In this sense, due to the nature of the wireless mesh system, some users might spend unnecessary money on satellites they don’t actually need. Before you make this mistake, make sure the applications you use would even benefit from more satellites. We think Orbi is the best Wi-Fi router available and this only becomes clearer when examining other routers available. When customers are trying to develop a local wireless network, they have two options basically. They can either go with a trendy wireless mesh system or a more traditional router-modem option. Most of the wireless mesh systems available, like Google Wi-Fi, are dual-band systems, which means they get significantly slower as more devices are added. Also, many of these systems are offered by startup companies whose futures are uncertain, like the company Eero. Thus, it’s unclear how much professional support your network will have in the future should you experience any disturbances or imperfections. When it comes to traditional router-modem options, these often result in systems that are powerful and simple but have unpredictable dead zones throughout. These are points where coverage is compromised or absent entirely. This can be common when covering a large distance or in certain houses or apartments. The mesh system of Orbi prevents these dead zones by allowing users to strategically place satellites throughout the network. Of course, traditional routers can respond to dead zones by being paired with Wi-Fi extenders, but these extenders rarely communicate with each other, resulting in inefficient coverage. Not to mention, these extenders are often not designed with the original router in mind, making management of the system much more difficult. At the end of the day, Orbi is the way to go. Since it’s made by Netgear, a reputable computer equipment company, its future is more certain. Orbi is one of the best Wi-Fi routers because you don’t’ have to worry about lack of support in the future, as Netgear is an industry leader when it comes to customer service. We think the best Wi-Fi routers not only facilitate fast connection speeds and a secure network but also take advantage of cutting-edge technology. Orbi satisfies this bill most notably because of its tri-band, wireless mesh system which is unique in the industry. We think wireless mesh systems are the future of wireless networks. Anyone wanting to adopt this approach to networking would benefit immensely from purchasing Orbi. We also love that Orbi is so simple and unassuming, both in appearance and in its installation. Many customers have noted that they were able to get their network up and running in under 15 minutes, which is unprecedented considering the complicated installations that some past routers have required. These inferior devices can leave you wishing you didn’t even have a router. You will never feel this way about Orbi. Users can use a simple smartphone application or online software to install a router or additional satellites. We think the best Wi-Fi routers of the future will function in a significantly different way than they do now. We think they will become portable, allowing users to create a local network wherever they go. Alternatively, we think routers might become obsolete in the future, as every user connects directly to source energy. There will be no need to build local networks when all connections are both wireless and direct. Of course, this is dependent on whether the internet even exists in the future in the same form that it does now. If the internet significantly changes, perhaps future routers will also change. Regardless, we think the future is going to be truly unimaginable. We think wireless mesh systems are just one step in this direction, as companies realize that building a network is truly a work of art. As this approach is developed in the future, customers will have more control over their technological experiences than ever before.